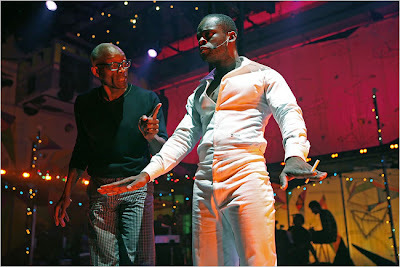 Last August we were invited to see the off-Broadway production of Fela, The Musical. It was a wonderful evening and an excellent production choreographed by Bill T Jones. The wonderful news is that the play is being re-launched on Broadway, thanks to funding from Will Smith and Jay-Z. The musical will launch at the EUGENE O'NEILL theatre on NOVEMBER 23rd. Cassava Republic will be bringing out a special book on Fela early next year. You heard it here first.. I have loved Bill T Jones forever. First saw him when I was nine. I missed the show the first time, we'll make sure I don't miss it this time. I look forward to your book on Fela. I am sure it will be a winner. All the best.